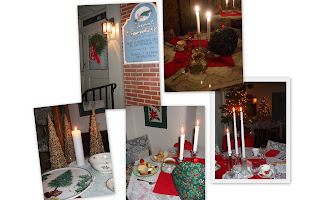 We celebrated our Candlelight Tea last night at Sweet Remembrances. The tea room was aglow with the flickering lights of the candles. The menu told the story of what was about to unfold. The first course included a miniature Gouda Cheese Ball rolled in fresh parsley and accompanied with assorted crackers. A complimentary glass of Chablis or White Zinfandel was offered with the cheese and crackers. Our sandwich selection included a warm Cheesy Artichoke Puffed Triangle, Olde English Sausage Rolls, Goat Cheese and Basil with Sun Dried Tomato Stars, Swiss Apple-Garlic Melt atop a sliced French Baguette, and Cranberry, Apple and Chicken Salad Triangle. Next, we served a Traditional English Cream Scone, a slice of Almond Poppy Seed Tea Bread accompanied with Mock Clotted Cream, Lemon Curd, Strawberry Preserves and a Fresh Fruit Skewer. For dessert, our guests enjoyed Golden Shortbread Stars, Buttery Pistachio Cookies, Chocolate Velvet Cheesecake, and a Petite Tiramisu. May your New Year be blessed with Peace and Prosperity! The Rosemary House and Sweet Remembrances. The Belsnickel is a German tradition from the 19th and early 20th century. The tradition traveled to the US with the immigrants and was generally practiced in Pennsylvania by members of the Reformed or Lutheran Churches. Usually a neighboring farmer dressed in an outlandish costume which included bells, furs and a masked or painted face. He brought goodies for the well behaved children and carried whips/sticks to punish the naughty. Costumes would vary from community to community. The Belsnickel was usually a man but could be a woman too and the visit could take place anytime between the first Sunday in December and New Years Day. Translating to "Nicholas in Fur", today's Santa Claus' fur trimmed suit originated with this tradition. Beginning in the 20th century Belsnickels often traveled in groups. The Mechanicsburg Museum Association hosted the visit with the Belsnickel. Angelica and her good friend Sage are both on the "well-behaved list". Cedar, too! The Museum Association in our town owns and maintains four buildings, one of which is the "Station Master's House". The station master, George Zacharias, oversaw the trains coming through the town. At one point there were 75 trains a day running on two tracks! Passenger trains, freight trains, mail trains, you name it. The little house is from the 1840's and these are some of the Christmas decorations the museum volunteers put together. Charming. We went for a drive one evening to see the holiday lights. It sure is pretty around town with all sorts of lovely decorations. From excess to simple, all types of holiday decorations can be found around town. Springerle Cookies are traditional German Anise Cakes which are stamped or rolled with a wooden mold that has been carved into quaint little designs and figures. Beat eggs til light, gradually add sugar and continue beating at a high speed for 15 - 20 minutes until batter is thick and lemon colored. Add anise. Sift flour and soda and blend with egg mixture at a low speed. Cover bowl with wax paper and let stand 15 minutes so it is easier to work with. Divide dough into thirds. On lightly floured surface, roll dough to 8" square, 1/4" thick. Let rest 1 minute. Flour mold and press design, cut around design and place cookie on lightly floured surface. Cover with a towel all night. Grease a cookie sheet well. Brush off excess flour from the cookies. Bake about 15 - 20 minutes at 300 degrees. Do not let cookies brown while baking and notice that they do not spread during baking. Store cookies in a tight container, place a cut apple in the jar if cookies become too hard. Substitute 2 tsp. cinnamon and 1 tsp. cloves instead of the anise. Lemon or almond flavoring could be substituted also. The baking soda can be eliminated for a flatter cookie. After cookies have cooled, the design can be painted with food coloring and a fine brush. By punching a hole at the top of each cookie before they are baked, one can insert colorful ribbon and hang them on the Christmas tree as traditionally done in Germany. Spices were considered so costly that many special spice chests were made to store and treasure them in. These two little cuties above are circa 1950 and are marked made in Japan. Definitely an older style chest. Made of tin, you can still read the names on the drawers. This is one of the oldest we have. 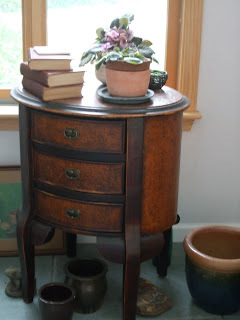 Just love the way the wooden knobs are done on this piece and it has an area for baking powder and baking soda. This is a sampling of the mortar and pestles that are readily available today. You can purchase them from The Rosemary House and begin your collection. These are ceramic. The most practical one would be the medium size pictured above. The small one pictured above and the one pictured below are very good for crushing seeds, aspirin, pills to feed your animals. We like the ceramic mortar and pestles because they are very easy to clean. The wooden and marble ones below are also available in our shop. Although they are not listed on the website, contact us if you are interested in additional information about them. Marble is also easy to clean and it is a very heavy mortar and pestle. (The cat won't knock this one off the counter). Wooden mortar and pestles tend to absorb odors so they aren't our favorites -- particularly if you are crushing strong smelling herbs such as garlic or cumin. If you intend to crush garlic, it is suggested you dedicate one Mortar and Pestle specifically for garlic. Collections, collections, collections! We have many of them. Most of them started by our mother Bertha Reppert. The Mortar and Pestle collection is one of the heaviest collections we have. The Mortar is the bowl in which herbs, spices, medicines, etc. are pulverized to the desired consistency. The Pestle is the tool used to pound or grind the herbs in the mortar. All the ones pictured above are either brass or cast iron. All used to grind herbs to use for medicine or cooking. These three are quite large. Huge really. The picture doesn't accurately display their size. Samples of the glass ones. Ceramic and even stone mortar and pestles, some collected internationally from Mexico and Spain. Not to mention wood. Olive wood and others. Christmas time almost guaranteed a new Mortar and Pestle would be under the tree to add to the collection. Cinnamon, Cinnamomum zeylanicum, is native to Sri Lanka (formerly Ceylon) and is the inner bark of a tropical evergreen tree. It's distinctive flavor is quite popular with all ages. We add cinnamon to our acorn squash and bake it in the oven and the whole crew is pleased. But add cinnamon to apple pie or cookies and everyone is clamoring for more. One of the favorite teas in the tea room is Harney and Son's Hot Cinnamon Spice a black tea and cinnamon combination that tastes just like cinnamon red hot candies. While cinnamon tastes good in baking and makes the house smell lovely when simmering either in water or cider, cinnamon has been getting much publicity recently for its medicinal use. A small study done in 2003 with 60 Type 2 diabetics indicated that as little as 1/2 teaspoon of cinnamon a day can lower blood glucose levels, triglycerides and LDL cholesterol! Let your food be your medicine. For a yummy Cinnamon Chip Scone Recipe, visit this prior post. Cloves comes from the Latin 'Clovus' which means "nails". Cloves are the unopened flower buds of Eugenia caryophyllus a tropical tree native to Indonesia. The spice is also cultivated in India, West Indies, Madagascar, Sri Lanka and Zanzibar. With a pungent and strongly aromatic flavor, cloves can easily over power a dish. Our favorite way to use them is to stud the ham with cloves every Easter. Many recipes call for an onion studded with cloves to make a bouillon, stock or soup. Often used in pickling spices and mulling spices, they flavor venison well also. Worcestershire Sauce has some cloves in it as well. Medicinally, clove oil is famous for its applications to the gum to numb the pain associated with toothaches. Cloves also help with flatulence and other digestive disturbances. Folklore says that sucking on two cloves helps to reduce the cravings for alcohol. Cardamom, Eletaria cardamomum, is a member of the ginger family and is grown mostly in India and Guatemala. It has a distinctively pungent flavor that is used in many cultures. Added to Turkish coffee, Arabs also use the green cardamom in meat and rice dishes. Scandinavians add the white to Christmas stollen, sweet breads and cookies. Cardamom is often an ingredient in curry as well. The white is treated to achieve that color, the Sulphur dioxide process is said to make it a milder flavor. The white is still fragrant and quite fun to use while crafting. The green is slightly more pungent. In either case the white or the green is the outer shell, the intense flavor comes from the tiny inner seeds. As with most spices, it is best freshly ground as ground cardamom loses its flavor quickly. I wish you had a scratch and sniff screen, ahh so fragrant, don't forget to add it to your spiced wine or cider too. And of course, it's an important ingredient in Chai. Freshly grated nutmeg is the absolute best! Just a little nutmeg grated on a pie fresh out of the oven ~oh my. I'm starting to drool just thinking about it. These two little graters are available in The Rosemary House for a modest investment. We sell 'em tied with a perky bow and a nutmeg. I love the ceramic grater the best because it doesn't hurt your fingers as you grate with it and you can use it for nutmeg, cinnamon and ginger too. Our mother collected everything, including these charming nutmeg graters from days gone by! This is just a small sampling of her nutmeg grater collection. These finger saving graters are my favorites. The one is clearly labeled: Patented June 7, 1907. More little tin graters. I love the one that clamps onto your kitchen counter. And the little tin box on the right both stores nutmeg and slides up and down the grater, more finger protection......do I sound like I've grated my fingers once too often? One year for Thanksgiving we each had a unique nutmeg grater as part of our place settings at the table. The scent of freshly grated nutmegs wafted thru the air as we all grated our own nutmeg on our desserts. Nutmeg is probably one of my favorite spices of the season. It provides such a pleasant flavor, adding just enough seasoning without being too hot and zippy. Both mace and nutmeg come from the same plant which grows in Grenada, and the Spice Islands. This botanical drawing illustrates the complexities of the fruit. There is a fleshy layer on the outside which is used to make a delicious jelly followed by the tentacle-like mace layer which is on the outside of the thin shell which contains the nutmeg. Three layers to reach the nut! When fresh, the mace layer is a brilliant scarlet red. Over a period of months it changes to the more familiar orange color. For every pound of nutmeg, the same tree produces only about 15% in weight of mace. Maybe that is why the Portuguese; who once controlled the spice trade, asked that more mace trees be planted than nutmeg! Like most spices, nutmeg or Myristica fragrans is more flavorful if you use the whole spice and grate it fresh as you need it. Mace is a more delicate flavor best used in cakes or sweet puddings or even on mashed potatoes and turnips. Nutmeg is lovely on pumpkin pie or apple pie or even grated on vanilla ice cream. 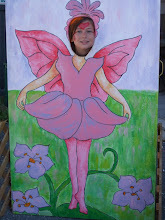 Susanna, our herbalist, shared the above information. However, to add to the nutmeg story, Nancy would like to share that when The Rosemary House first opened, 40 years ago, she can remember selling a cupful of nutmegs for 50 cents. Now, in 2008, we are still selling nutmegs, but they are 25 cents a piece. Still seems a bargain! Tomorrows post will feature nutmeg graters, both old and new. Check back! This little ornament was the craft at our annual Holiday Workshop and Tea Party this year. Once the apples were dehydrated this fragrant decoration was a cinch to glue together. Slice the apples thick to dry them. We used a dehydrator but you can do it in the oven as well. In the oven it takes about 6 hours at 150 degrees, crack the oven door a bit. We first soak the apples in lemon lime soda to keep them from turning brown. Then cut the apple pieces in half and hot glue the halves to a cinnamon stick, fill in along the middle or the inside pieces of the apple with some cloves and dried cranberries. A piece of ribbon to hang the ornament up and just like that you are done! This pretty little collection of Christmas teacups is on display in the tea room. Sadly, they are either chipped, cracked or badly stained and have been resigned to mere adornment for the season. Retired.... lucky cups. This adorable teapot was a Christmas gift several years ago from Brother-in-Law David. Typically this pot is put into service when we prepare hot chocolate for the kids after they have been out playing in the snow. Although we had a light dusting of snow last week that was pretty exciting, we're still anticipating the first measurable snowfall. Ho! Ho! Ho! This jolly old elf 'tea for one' set resides under the tea themed Christmas tree, smiling at all who notice him. Although the tea room is dark right now, there is a hint of anticipation in the air as several holiday events are scheduled for the weekend, including the First Saturday Tea and our annual Holiday Craft Class and Tea scheduled for Sunday and Monday. The tables, set for the holidays, quietly wait for guests and tea, food and laughter. One of our favorites scones to serve during this season are Holiday Scones, a delightful combination of cranberry, orange, and pecans. Combine cranberries and 2 Tbsp. sugar in small bowl; mix well. Let stand for 5 minutes. Mix flour, 1/4 c. sugar, baking powder and salt in large bowl. Cut in butter until crumbly. Beat eggs, orange juice, orange zest, and vanilla in small bowl. Add to dry ingredients; stir until moistened. Knead in cranberries and pecans to distribute evenly; dough will be sticky. Divide dough into 2 balls. With a rolling pin or your hands, flatten each ball into a 6" circle . Cut each circle into 8 triangles. Place triangles on parchment lined baking sheet. Combine 1 egg white with 1/2 tsp. water. Brush the tops of the triangles with egg wash and sprinkle liberally with sugar. Bake at 425 degrees for 13 - 15 minutes, or until done. "We wish you a Figgy Pudding"